Diamonds recovered from the Gahcho Kue Mine in the Northwest Territories. Source: Mountain Province Diamonds Inc.
Mountain Province Diamonds Inc. [MPVD-TSX, NASDAQ] on Thursday April 11 released updated inferred resources for the Faraday 2 kimberlite at its 100%-owned Kennady North Project, in the Northwest Territories. The Kennady North Project is located 10 km north of the Gahcho Kue diamond mine, a joint venture between De Beers Canada Inc. (51%) and Mountain Province (49). Gahcho Kue is a fly-in-fly out operation located 280 km northeast of Yellowknife, N.W.T. On Thursday, Mountain Province said the updated resource at Faraday 2 reflects new drilling and microdiamond analysis for the northwest extension of the deposit, as well as revised grade and size frequency distribution models for the previously defined domains. As a result, the resource increased significantly compared to the prior estimate in terms of tonnes, grade and average price, more than doubling the in situ value from US$350 million to US$750 million. The inferred mineral resource estimate for the Faraday 2 Kimberlite now stands a 2.07 million tonnes, grading 2.63 carats per tonne, including 5.45 million carats at US$140 per carat. That compares to the 2017 estimate of 1.39 million tonnes, grading 2.24 carats per tonne, containing 3.13 million carats, valued at US$112 per tonne. The latest estimate of 5.45 million carats of diamonds, marks a 74% increase from the 2017 estimate. Mountain Province shares advanced on the news, rising 9.01% or 10 cents to $1.21. The shares trade in a 52-week range of $1.09 and $3.72. Faraday 2 is still years away from potential development. “The Faraday 2 project is one of three known kimberlites within our wholly-owned exploration properties adjacent to the Gahcho Kue Mine,” said Mountain Province CEO Stuart Brown. “As anticipated from our microdiamond results reported earlier this year, the inclusion of the northwest extension of Faraday 2 has greatly increased the value of this resource and at an average diamond value of US$140 per carat, offers significant potential,” he said. The Faraday 2 kimberlite is an irregularly shaped, inclined pipe-like body that has been delineated for over 600 metres and remains open to the northwest. The company was in the news recently when it announced the recovery of a high-quality 95-carat diamond from its Gahcho Kue diamond mine in the Canadian Northwest Territories. The stone is a white octahedron of top clarity and will be sold in the next tender sale in late June. It is the largest gem-quality diamond recovered from Gahcho Kue during its first two years of production and the fourth largest stone overall. Located at Kennady Lake, Gahcho Kue is an open pit operation that aims to mine three kimberlites in sequence. Average annual production is targeted at 4.5 million carats annually. 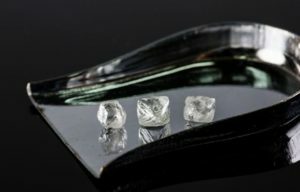 It is the third diamond mine in Canada for De Beers. (The others are the suspended Snap Lake Mine and the Victor Mine). The recovery of the 95-carat diamond could be indicative of the potential for further large stone recoveries, particularly if the stone was recovered from the Hearne deposit where ore mining began during the second quarter of 2018. Mountain Province did not indicate the provenance of the stone. “However, we’d expect the net proceeds from this individual stone to be relatively immaterial, likely less than $3 million,” Scotiabank wrote in an investment report.